We are very glad to announce the success of the merger between our two affiliated sites: www.ChineseKungFuHustle.com (KFH) and www.ChineseClothingOnline.com (CCL). Now, all KFH's popular products (and more new Kung Fu items, click here to see them) are available at CCL and all KFH's personnel are working under CCL. CCL embraces state-of-the-art online shopping technology, for example, it supports multiple currencies including USD, EUR, GBP, CAD, AUD and etc. In addition, CCL supplies much wider choices in Chinese clothing, such as Cheongsam, Hanfu, Ethnic costumes and it keeps adding new products almost every day. KFH contributes its specialism in Kung Fu / Tai Chi / Wushu merchandise and enriches CCL's product lines. We anticipate the merger will benefit our clients of both KFH and CCL and our company. KFH will maintain its operation until end of 2012. From Jan-01-2013 (new year, new start) visitors of KFH will be automatically redirected to CCL. Please browse through our CATALOG at left or PHOTO GALLERY at right. When you checkout, you will be presented with the option to either login or create a new account. Any items in your visitor's cart will be transferred properly when you sign in. If you sign up as a customer or login, you can save your shopping cart until you are ready to purchase! Chinese martial arts refers to the enormous variety of martial art styles native to China. Kung fu (Chinese: 功夫 pinyin: Gōngfu) and wushu (Chinese: 武術) are popular Chinese terms that have become synonymous with Chinese martial arts. For more information about these specific terms, see Kung fu (term) and Wushu (term). According to the most commonly accepted versions of the legend, the Chinese martial arts trace their origin to thousands of years ago in China. As the Chinese writing system traces back to the Shang Dynasty (1766 BCE - 1122 BCE), claims of entire books regarding the martial arts being written at earlier times are suspect. The Art of War, written during the 6th century BCE by Sun Tzu, deals directly with military warfare. There are passages in the Zhuang Zi that pertain to the psychology and practice of martial arts. Zhuang Zi, the author of the same name, is believed to have lived in the 4th century BCE. The Tao Te Ching (Dao De Jing), often credited to Lao Zi, contains principles that are applicable to martial arts, but the dating of this work is controversial. Archery and charioteering were a part of the &quot;six arts&quot; (Traditional Chinese: 六藝; Simplified Chinese: 六藝; pinyin: liu yi, also including rites, music, calligraphy and mathematics) of the Zhou Dynasty (1122 BCE - 256 BCE), according to the text Zhou Li. According to legend, the reign of the Yellow Emperor (traditional date of ascension to the throne, 2698 BC) introduced the earliest forms of martial arts to China. The Yellow Emperor is described as a famous military general who, before becoming China's leader, wrote a lengthy treatise about martial arts. He allegedly developed the practice of Jiao di or horn-butting and utilized it in war. Jiao di evolved during the Zhou Dynasty into a combat wrestling system called Jiao li (between tenth and third century BCE). The practice of Jiao li in the Zhou Dynasty was recorded in the Classic of Rites]] This combat system included techniques such as strikes, throws, joint manipulation, and pressure point attacks. Jiao li became a sport during the Qin Dynasty (221 BCE - 207 BCE). Currently, Jiao li is known as Shuai jiao, its modern form. Taoist monks are claimed to have been practicing physical exercises that resemble Tai Chi Chuan at least as early as the 500 BCE era. In 39-92 CE, &quot;Six Chapters of Hand Fighting&quot;, were included in the Han Shu (history of the Former Han Dynasty) written by Pan Ku. Also, the noted physician, Hua T'uo, composed the &quot;Five Animals Play&quot; - tiger, deer, monkey, bear, and bird, around 220 CE. As stated earlier, the Kung Fu that is practiced today developed over the centuries and many of the later additions to Kung Fu, such as the Shaolin Kung Fu style, later animal forms, and the drunken style were incorporated from various martial arts forms that came into existence later on in China and have accurate historical data relating to their inventors. In regard to the Shaolin style that is currently popular, Yi Jīn Jīng attributed Bodhidharma (Pu Tai Ta Mo in Chinese or Daruma Daishi in Japanese), a visiting Indian Buddhist monk, as the progenitor. Bodhidharma visited a monastery, and was unhappy to find that some of the monks would fall asleep during their meditations. Deciding that they needed more physical stamina, he introduced to the monks a system of exercises that later developed into the modern Shaolin style. However, the texts that first attributed him to Shaolinquan have been shown to be unlikely forgeries. Historical evidence has shown that the Shaolin monks during and before this time harboured retired soldiers who taught the monks self-defense techniques that they had learned during military training. In around 500 CE, the Shaolin monks, in order to protect themselves from bandits and criminals, began to codify what they had learned into a &quot;Shaolin&quot; style. The fighting styles that are practiced today were developed over the centuries, after having incorporated forms that came into existence later. Some of these include Bagua, Drunken Boxing, Eagle Claw, Five Animals, Hsing I, Hung Gar, Lau Gar, Monkey, Praying Mantis, White Crane, Wing Chun and Tai Chi Chuan. For a list of styles, see list of Chinese martial arts. Hundreds of different styles of Chinese martial arts have developed over the past two to four thousand years, many distinctive styles with their own sets of techniques and ideas. Also, there are many themes common to different styles that lead many to characterize them as belonging to generalized &quot;families&quot; (家, jiā) of martial art styles. There are styles that mimic movements from animals and others that gather inspiration from various Chinese philosophies. Some styles put most of their focus into the belief of the harnessing of qi energy, while others concentrate solely on competition and exhibition. Chinese martial arts can be split into various categories to differentiate them: For example, external (外家拳) and internal (內家拳) (or hard (剛) and soft (柔)). Chinese martial arts can also be categorized by location, as in northern (北拳) and southern (南拳) as well, referring to what part of China the styles originated from, separated by the Yangtze River (Chang Jiang); Chinese martial arts may even be classified according to their province or city. The main perceived difference about northern and southern styles is that the northern styles tend to emphasize kicks, jumps and generally fluid and rapid movement, while the southern styles focus more on strong arm and hand techniques, and stable, immovable stances and footwork. 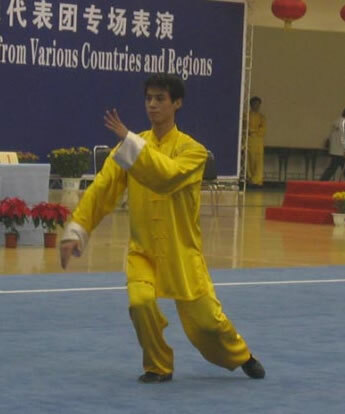 Examples of the northern styles include Changquan and the sword and broadsword routines used in contemporary Wushu competitions, and examples of the southern styles include Nanquan, Houquan (monkey style) and Wing Chun. Chinese martial arts can also be divided according to religion, imitative-styles (象形拳), and more. The practise of Chinese martial arts can be divides into two categories Taolu and sanshou. Most styles of Chinese martial arts contain practice of the application of techniques (both as prepared drills and as free sparring), but also the practice of what is known as forms, or taolu (Chinese: 套路; pinyin: t&agrave;o l? in Chinese. Forms are a pre-choreographed series of techniques and movements, performed alone or with one or more partners. Another important part of the training, as in most other physical activities, is what is referred to as basics (基本功), these basics condition the &quot;beginner&quot; for further training. Basics are a vital part of the training, as a student cannot progress to the more advanced stages without them; without strong and flexible muscles, many movements of Chinese martial arts are simply impossible to perform correctly. Basics include such things as stretching, strengthening of muscles, bones and tendons, stamina training, and basic stances, kicks and punches. Some styles also consider jumping, jump-kicks and acrobatics basics. In addition, many styles teach a few basic techniques as well, before moving on to forms. These techniques are normally the most common techniques of the specific style, found in many of the style's forms. Chinese martial arts pay considerable attention to stretching. Common stretching exercises include general warm-up stretching, stretching in pairs, and various types of stretch kicks, usually practiced with speed. As many Chinese martial arts are formed to suit children and higher-level students who have been practicing since childhood, they can include basic exercises that require very high flexibility in order to be possible to perform at all. Forms or taolu are series of techniques put together after one another so they can be practiced as one whole set of movements. Some say that forms resemble a choreographed dance, though martial artists often argue that a general difference is the speed and explosiveness seen in most external styles, and that the movements are actual fighting techniques. These forms sought to incorporate both the internal and external of kung fu. A kung fu form needs to be both practical, usable and applicable as well as promoting flow, meditation, flexibility, balance and coordination. Often kung fu teachers are heard to say &quot;train your form as if you were sparring and spar as if it were a form&quot;. There are two types of forms in Chinese martial arts. Most common are the solo forms, performed alone by one person, but there are also &quot;sparring&quot; forms, which are a type of choreographed fighting sets performed by two or more people. Many styles consider forms as one of the most important practices, as they gradually build up the practitioner's strength and flexibility, speed and stamina, and teach balance and coordination. They also function as a tool for both the students and the teacher to remember the many techniques taught by the style, and sort them into various groups. A style can have many compartments, both empty-handed and with weapons. In most styles, empty-handed techniques are the most common, but many styles also contain forms using a wide range of weapons of various length and type, utilizing one or two hands. There are also styles that only practice a certain weapon, containing only forms with the specific weapon. Forms are meant to work the body. Once a basic structure is able be maintained in the body forms are then used to work that structure. Forms develop a sensibility of moving from position to position. This teaches the body to react. Some forms focus specifically on punching and kicking, while others focus on joint manipulation, grappling, jump kicking, or weapons. Still other forms focus on different styles of movement, or on using specific hand configurations. Often, forms will combine several of these attributes. Even though forms of Chinese martial arts are based on martial techniques, the movements might not always be identical to how the techniques they symbolize would look when applied in combat. This is due to the way many forms have been elaborated, on the one hand to provide better combat preparedness and on the other hand to look more beautiful. One easily understood manifestation of this tendency toward elaborations that go beyond what most often might be used in combat is the inclusion of lower stances and higher kicks. The regular practice of techniques while using lower stances both adds strength to the same techniques when used with higher stances, and also facilitates using the same techniques in the lower stances when the realities of combat make doing so the most appropriate choice. In recent years, as the perceived need for self-defense has decreased, many modern schools have replaced practical defense or offense movements with acrobatic feats that are more spectacular to watch, thereby gaining favor during exhibitions and competitions. The mainland Chinese government has especially been criticized by traditionalists for &quot;watering down&quot; the wushu competition training it promotes. Appearances have been important in many traditional forms as well, seen as a sign of balance but not the most important requirement of successful training. Some martial artists have looked for supplementary income for performing on the streets or in theaters, although in the most traditional schools such performance is forbidden. Another reason why the martial techniques might look different in forms is thought, by some, to come from a need to &quot;disguise&quot; the actual functions of the techniques from outsiders (from rival schools or from the authorities as legend has it happened in Okinawa). The intention was to leave the forms in such a state that they could be performed in front of others without revealing their actual martial functions, while retaining their original functionality in a less obvious form. However some forms were created for other reasons other than combat and martial application, some forms were created to help martial artists to develop certain qualities. For example acrobatics blended into martial arts helps martial practitioners develop strength, balance and flexibility as well as looking aesthetic. As forms have grown in complexity and quantity over the years, and many forms alone could be practiced for a lifetime, styles of modern Chinese martial arts have developed that concentrate solely on forms, and do not practice application at all. These styles are primarily aimed at exhibition and competition, and often include more acrobatic jumps and movements added for enhanced visual effect compared to the traditional styles. Those who generally prefer to practice traditional styles, focused less on exhibition, are often referred to as traditionalists. Many traditionalists consider the evolution of today's Chinese martial arts as undesirable, saying that much of its original value is lost. Application training or sparring refers to the training of putting the martial techniques to use. When and how applications are taught varies from style to style, but in the beginning, most styles focus on certain drills where each person knows what technique is being practiced and what attack to expect. Chinese martial arts usually contain a large arsenal of techniques and make use of the whole body, efficiency and effectiveness is what the techniques are based on. However many Chinese martial arts appear to be flowery and 'fancier' than other arts but the movements are very meaningful in terms of application. Gradually, fewer and fewer rules are applied, and the students learn how to react and feel what technique to use, depending on the situation and the type of opponent. Nowadays, many Chinese martial arts choose not to practice much application at all, as the need for self-defense has become less significant in the societies of today. The introduction of firearms has made the traditional weapons and empty-handed martial arts lose much of their power, as even a completely untrained person can kill a master of any style by firing a gun from a safe distance. Before guns existed, however, knowledge of martial arts could save both your and your family's life. Because of this, the applications of the techniques were often considered sacred, and were commonly kept secret from all but family and the closest friends. Today, the views on this tradition of keeping things secret are very mixed, and some schools openly teach applications to anyone willing to learn. Others still require the students to show that they are worthy before teaching applications, &quot;worthy&quot; usually meaning that the students can be trusted that they will not use their knowledge to a bad purpose. It must be pointed out in fairness that some of the masters were in fact members of the criminal underworld (although they may have perceived themselves as righteous) and that some of the actual skill and applications of the various systems were developed in real and extremely violent confrontations both armed and unarmed. This dichotomy did and still does exist. There are also modern styles that practice application and even focus solely on them,these are rarely found being practiced and taught alone and normally found alongside traditional Chinese martial arts, these are aimed mostly at modern competition. One such style that has grown quite popular is called Sanda (or Sanshou). Many schools of Chinese martial arts schools teach sanshou and work to incorporate its movement,characteristics and theory into sanshou's modern context.It is popular as a competition event and allows martial practicians to both practice and put their skill to use in a friendly non hostile environment. It is similar to Muay Thai and is a type of sparring competition where the competitors wear protection and gloves, and get points when scoring a hit on the opponent or performing a successful throw. Sanshou involved both stand up striking and grappling and as a modern competition rules are limited for safety reasons in turn limiting technique and other components of the martial arts.. However many of these skills and techniques are still practiced among many sanshou practicians, such as chin na and ground fighting. Most Chinese styles also make use of training the broad arsenal of Chinese weapons for conditioning the body as well as coordination and strategy drills. The concept of q?or ch'i (氣), the inner energy or &quot;life force&quot; that is said to animate living beings, is encountered in almost all styles of Chinese martial arts. Internal styles are reputed to cultivate its use differently than external styles. One's qi can be improved and strengthened through the regular practice of various physical and mental exercises known as qigong. Though qigong is not a martial art itself, it is often incorporated in Chinese martial arts and, thus, practiced as an integral part to strengthen one's internal abilities. There are many ideas regarding controlling one's qi energy to such an extent that it can be used for healing oneself or others: the goal of medical qigong. Some styles believe in focusing qi into a single point when attacking and aim at specific areas of the human body (similar to the study of acupressure), to cause maximum damage or disable certain functions of the body. Some go so far as to think that at an advanced level it is (or was, as some believe such abilities to now be lost, if they ever existed) possible to cause harm without even touching the opponent, a popular concept in Chinese martial arts movies. kung fu clothing, kung fu uniform, kung fu uniforms, kung fu shirt, kung fu suit kung fu, shaolin, tai chi, qi gong, wushu wing tsun, taiji , chinese kung fu, kung fu master, chinese martial arts qigong, shaolin kung fu, tai chi chuan, taijiquan bruce lee, jet li, jacky chan martial arts, tai chi uniform, taiji uniform, taiji sword, tai ji, tai ji quan. For an overview of styles, see Styles of Chinese martial arts. The hundreds of different styles and schools of Chinese martial arts (中國武術) are collectively called Kung Fu (功夫), Wushu (武術), Kuoshu (國術), or Ch'uan Fa (拳法), depending on the persons or groups doing so. The following list is by no means exhaustive. Five Ancestors (五祖拳) - Wuzuquan or Ngo Cho Kun. Jing Wu Men (精武門) - Jing Wu, a famous school founded in Shanghai that teaches several different styles. Liu Seong Kuntao (also Liu Seong Gung Fu, Liu Seong Chuan Fa) A modern style combining the martial arts of China and Indonesia and is now based in the United States. Pai lum (白龍) - White Dragon, Pai Family Method, modern style based on Kenpo with infusion of Chinese flavors found mainly in the US and Canada. Praying Mantis: see either Northern or Southern Praying Mantis. Shen Lung Kung Fu (神龍功夫) - Modern variations of Southern style chinese martial arts based in the United States. Zan Shou - Splashing Hands. Northern Shaolin style of close combat. Chinese martial arts may be divided into Neijia (外家, internal family) or Waijia (外家, external family) styles. Many styles combine both internal and external techiniques, Chow Gar is a good example of this. Non-internal styles may generally be considered external styles.